The city of Edmonton is lively – full of culture and colour. Unfortunately for residents, some of these pops of colour have been put there illegally. For every sanctioned mural in the city, there are ten pieces of street art. Staining storefronts, homes and public places, graffiti can be overwhelming. Call our Edmonton graffiti removal services instead of begin overrun. Unlike other home maintenance issues, there is no way to prevent graffiti from starting or spreading over your property. By calling Gorilla property services you can make sure to have the issue dealt with professionally and quickly. Due to the portability of aerosol-based spray paints, both commercial and residential graffiti is at an all time high. Ranging from murals to simple tags, these makes are stains on your property and difficult to remove. Equipped with the proper knowledge and tools, our Gorillas treat your property right. In a modern age, it is not unheard of for property-owners to take to the internet in search of a ‘quick-fix’ to graffiti removal but more often than not, these methods can make the staining worse or even cause damage to your property. The outer materials of certain properties are porous or delicate and treating them roughly can cause damage the outer layers and prove to be a headache later on. Our Gorillas use eco-friendly cleaning solutions combined with a little elbow grease. This combination guarantees removal of the tag itself and any overspray that occurs. 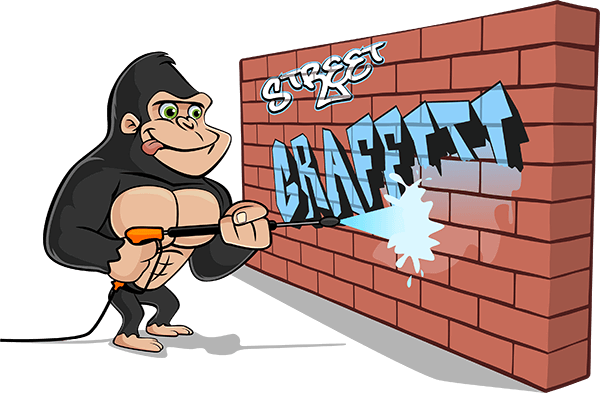 If you find that you are being hit regularly by vandals, our Gorillas offer a routine service. Instead of booking an appointment each and every time that you find a stain, residents can set themselves up for our Edmonton graffiti removal services bi-weekly, or even weekly.